The Envision Festival 2018 Full Lineup Has Finally Arrived! 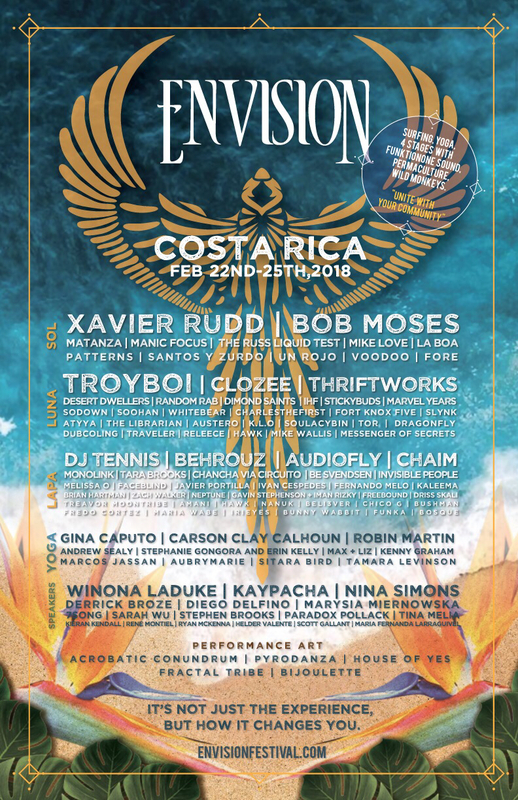 UVITA, COSTA RICA: Envision has just announced the 2018 music lineup for the eighth edition of this life changing event. Held between February 21st to February 26th and nestled sweetly in the heart of a jungle paradise in Uvita, Costa Rica. The announcement continues the festival’s tradition of serving up unique and eclectic lineups with flavors for palates from all over the world. As a tastemaker in Latin America and a top festival-to-play for the upper echelon in globally recognized musicians, Envision always seeks to push the envelope and 2018 will be no exception. Envision offers heavy hitting headliners and some of the most enchanting emerging talent in house and bass music, but this year’s lineup goes a step further with hand curated complements to an ethos centered around cultural awareness on three internationally acclaimed, flame-throwing, projection mapped dance music stages. With more than 100+ musicians converging at the festival, 2018 is set to be the most multicultural Envision lineup to date. Headliners topping the bill include the Australian social activist and fan favorite, Xavier Rudd, who sets the tone for the year. For his first Envision appearance, the high-octane UK-based sensation TroyBoi will join the fray and the venerable pop savvy Canadians Bob Moses will infuse a few timeless moments with their own special mix of live and electronic instruments on the mainstage. From America, New Orleans-based face melting legend The Russ Liquid Test, and Minnesota hailing chaos tamer, Manic Focus are sure to rubber more than a few necks. Plus, the French-born producer and bass master CloZee will remind us why she’s a favorite at Envision with her fierce and stylish beats. Rounding out the top slots at the world famous Lapa Stage, Israeli dynamo Chaim will hand-deliver his next level sounds, and the Italian with the badass backhand DJ Tennis will slice up his multilayered cake of sweet sweet house music. With the addition of Spanish techno lords AudioFly, the jetsetting staple of Don’t Sit On The Furniture and Robot Heart Behrouz, and Berlin born Monolink, who is known to lather saucy live instrumentals in dreamy bouncing bass, the house and techno lovers have a lot to be excited about. More than ever, Envision celebrates choice local flavors in what is already an expansive spread of international musical delicacies, by adding world famous Costa Rican artists like Santos y Zurdo and Patterns. Also on the bill from Chile, Envision welcomes Matanza, bringing a minimal funk to the dancefloor. Columbian orchestral ensemble La BOA will offer an authentic sample of true to form afrobeat, while Chancha via Circuito blends sound from the underground of South America with the blissed out house usually found only on a sunrise in the deep playa of Burning Man.